This entry was posted on 19th June 2014 by The Salon Look Girl. Tis the season of summer holidays – sun, sea, sand, beaches, nights out – the list goes on. We all love these summer times – but we all like to ensure we are looking our best – and sometimes (most of the time for us girls) that depends on lots of different products. 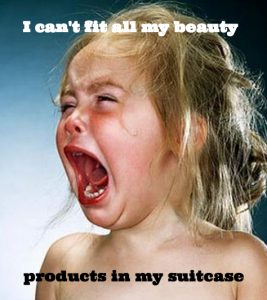 This is fine when you are at home, but when you are travelling there are generally weight restrictions on luggage , so here are some tips on how to double up the use of your favourite products and save room in your suitcase! I would say for most girls taking conditioner on holiday is a must. The salt from the sea water, chlorine from the pool and the UV rays of the sun are a bit of a recipe for hair disaster – and conditioner is a must to help tame knotty tresses. You don’t need to take another bottle of leave in conditioner; you can simply use a small amount of normal conditioner. I would advise you to use a little amount and just on the ends of your hair that tend to get driest. A teeny tiny pot of Vaseline can be used in so many ways. Use as eye brightener. Vaseline can help you create a really fresh and dewy look which is perfect for summer evenings. Simply pop some Vaseline to your lids for a dewy and radiant glow. Use as a highlighter. Dab Vaseline along your cheek bones to highlight. This again will give a dewy and radiant look! A razor is pretty essential on holiday to keep your legs looking fab, however a big can of shaving foam could take up some precious suitcase space. Swap your standard razor for one with built in foaming strips to save you some space. Talcum powder is a great way to leave your skin feeling cool and soothed after a hot day at the beach. You can also use it in between washes in the same way that you would use dry shampoo. That’s another thing off your list! Beauty oils are fairly new to the beauty industry but are a really fab product. Use them as a moisturiser to hydrate dry skin, but also as a shimmer fying agent. Most beauty oils will give your skin a really glossy glow and this is perfect for ensuring your skin looks its best during your holiday.